It has been a while since I posted about the Kreifels family. Last time, we looked at what little I know about Louis Kreifels’ youth in Otoe County, Nebraska. On May 28, 1889 at the age of 28, he married Josephine Ortman. This is a fascinating branch of Dale’s family tree that I am anxious to learn more about. And luckily, there are now some European church records available online that will potentially allow me to take this branch of the family tree back several more generations. The starting information we had about Josephine comes from a few different sources. The Kreifels family book and other material from the Kreifels side gives us just a few bare-bones details. Then in October, 1995, Dale and I were lucky enough to meet up with some of Josephine’s nieces and nephews still living in the Omaha area. They were able to fill in some of the blanks – both on the genealogy facts as well as some more family stories. Now with the church records online, I should be able to someday flesh out a pretty complete family history for her. The Kreifels book suggested that Josephine was born in Vienna, Austria but I don’t believe this to be true – I think her mother or grandmother may have had Viennese roots and I hope to sort that out someday. What we know for sure is that her father’s side of the family was from a little town in Bavaria once called “Plan”. Today, that area is no longer German-speaking and is located in today’s Czech Republic, and the town is now known as Planá. If you zoom out on this map, you’ll see that Planá is about 50 miles northwest of the city of Pilsen – famous for its “Pilsner” beer. The town is just a few miles east of today’s German border with the Czech Republic. I took a little time to search through the online records and was successful in locating not only Josephine’s baptismal record but also her father’s baptismal record and her parents’ marriage record. Here is the left-hand side of the baptism register, showing that she was actually born on April 23, 1870 but baptized on April 24. 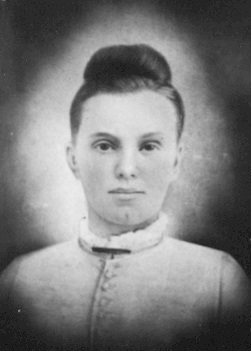 Her given name was “Josepha” and the check marks to the right of her name correspond to columns marked “Catholic”, “female”, and “marital” (i.e., parents were married). The far right entry says that the midwife’s name was Antonia Ortmann – I would guess she is a relative. I’ve never seen midwife names in church records before! The right-hand side of the register shows the parents’ names. I haven’t put much effort into completely deciphering it, but the father’s name of Ferdinand Anton Ortmann and the mother’s name of Elizabeth Ortmann (with maiden name of Lindner visible a couple of lines down) match exactly with our other sources about Josephine. I’m sure there’s other juicy information here about his profession, etc. but getting this translated will have to wait for another day. The family story is that the Ortmans were innkeepers in Plan/Planá until their business burned down, prompting them to emigrate to America.